3 of the most famous straight line race cars in the history of motorsports are pictured on the cover. "I've known about these guys since I was a little kid. . .real clever engineering. . .just a great, great piece of history. "THE CHRISMAN LEGACY/ALWAYS FASTER is a book that I highly recommend and I give it a perfect 8 out of 8 sparkplugs, one of only a handful of books that are this good." The 'Qualifier'* numbered editions that include a beautiful color dust jacket as pictured at left. The 'Qualifier' standard editions available from us are numbered from 201 to 1,000. There were only 800 of the Qualifier editions printed. "The one thing I learned from the Chrisman Family was that you have to do your best or get left behind." 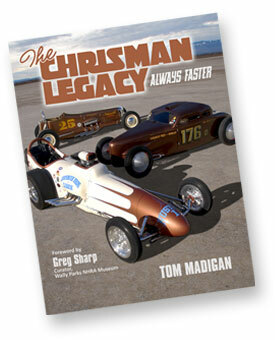 "No doubt the Chrisman Family has been good for drag racing." "Art worked for me and Jack drove for me, both were totally professional. They were the best to me." - Ed Pink "The Old Master"
"Art & Lloyd along with their father Evert and Uncle Jack Chrisman were and are great examples of the term 'Hot Rodder'. As long as it had a motor, they were interested. And let's face it, Art still is!" Tom Madigan has been part of the Southern California car culture since the 1950's. He not only competed against drag racing pioneers, he has been writing about them since the 1960's as a contributor to Motorcade magazine, a feature editor for Popular Hot Rodding magazine, and as author of several books, including Edelbrock/Made in USA; The Bill Stroppe Story; The Loner/The Story of a Drag Racer; Fuel and Guts/The Birth of Top Fuel Drag Racing; Snake vs. Moongoose/How a Rivalry Changed Drag Racing Forever; Hurricane/The Bob Hannah Story; and now The Chrisman Legacy/Always Faster. Tom is the recipient of the Motor Press Guild's Dean Batchelor award for Edelbrock/Made in USA.